Great Holiday Savings! 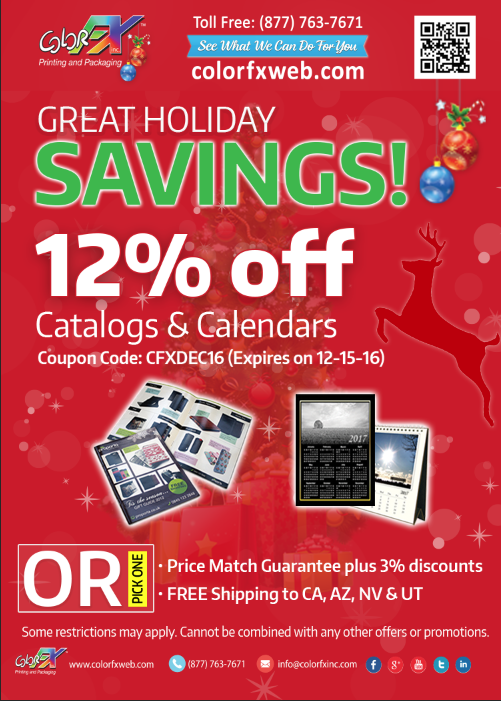 Save 12% off on Catalogs & Calendars. Please use coupon code: CFXDEC16. Expires 12-15-16. 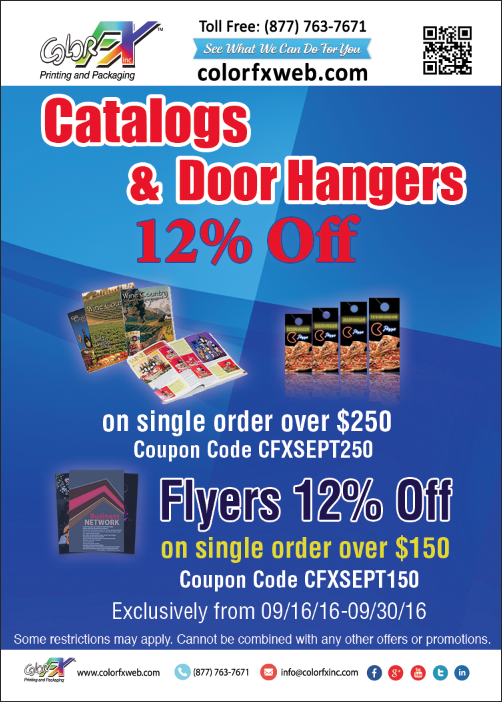 Save 12% on Catalogs & Door Hangers on single order of $250. Save 12% on Flyers on single order of $150. Expires 09-30-16. 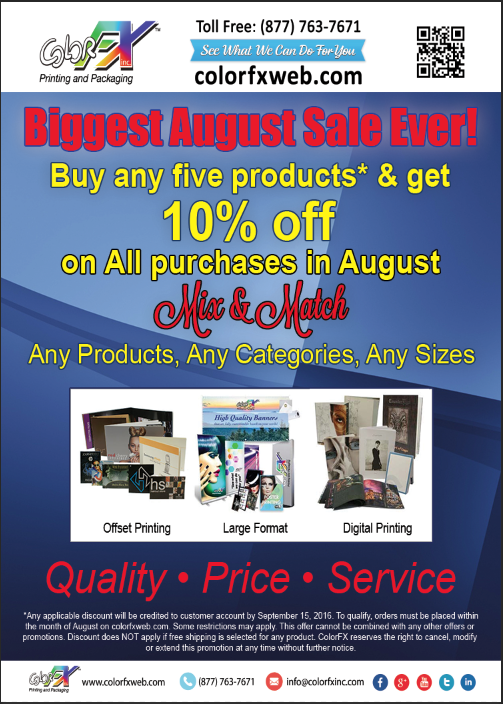 Coupon Code: Catalogs & Door Hangers-CFXSEPT250 & Flyers CFXSEPT150. Call us at 877-763-7671 or visit www.colorfxweb.com. We fulfill custom calendar printing orders in three sizes: standard 11” x 8.5”, medium 11” x 11”, and large 12” x 12”, with or without covers. Within these size ranges exists an almost infinite range of customizable options. Looking for 100# glossy book paper? We’ve got that. How about the number of pages? We offer 24, 28, and 32 page lengths as standard, but we can customize your order as needed. We offer from 500 to 30,000 calendars per order, and anything in between. 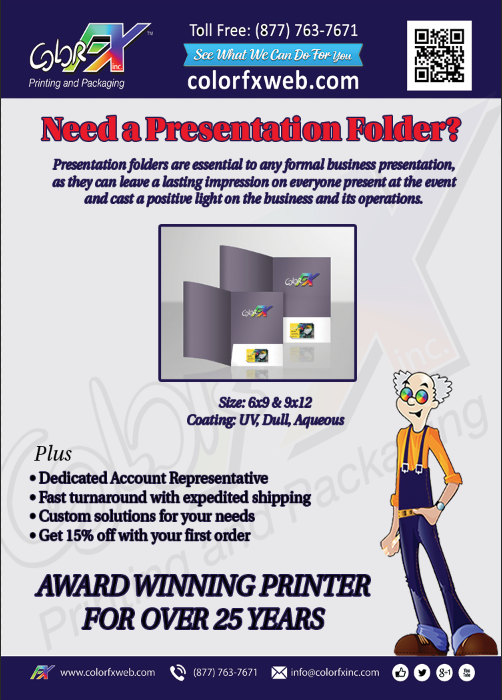 Flyer printing is a great way for your customers to market their business. Color FX Web offers top-quality wholesale flyer printing, designed to stand out from the crowd. These inexpensive yet effective marketing materials are ideal for promoting the grand opening of a new business, announcing a sale, inviting customers to a special event, or any other reason your customers need to reach a large audience. The quality of a flyer says a lot about the business it’s promoting. If it’s difficult to read, visually unappealing, or poor quality, this is a direct reflection on the business. Customers won’t be intrigued to keep reading or follow the call to action listed if they don’t feel it’s worth their time. Color FX Web makes it easier than ever to provide your customers with flyer printing that is second-to-none. Not only do we adhere to the highest standards of quality, we also offer near endless customization options, designed to bring flyers the attention they deserve. As your printing partner, we’re here to cater to your customers, so the finished product is exactly what they had in mind. No matter what colors, graphics and paper styles they want, it’s our job to make it happen. Color FX Web understands that flyers are often the first impression potential customers get of a business, so it’s important to make a great one that draws them in. A banner is a very large piece of marketing material. It’s important to ensure that each one is designed according to your customers’ exact specifications, as the wrong color or size can change the entire impact of the message. Our team will be with you every step of the way, to ensure that your finished product is exactly what you requested. Many wholesale printers make it very difficult to have a conversation with an actual representative. We understand how frustrating that is, so we guarantee you’ll never receive that type of treatment from Color FX Web. When you place your order, you’ll be assigned a dedicated account representative. This person will serve as your sole point of contact throughout the entire production process. They can address any questions or comments you may have and provide you with status updates on your banners. 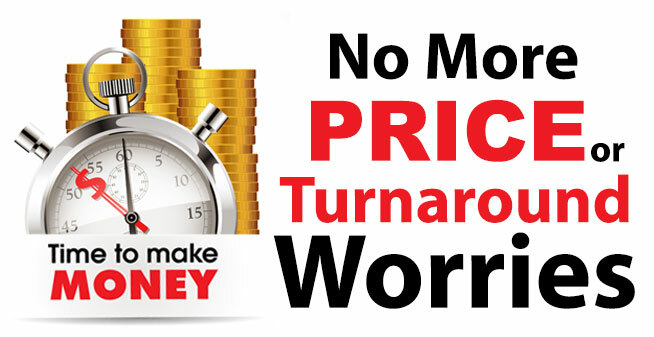 No More Price or Turnaround Worries! When marketing your print business to potential clients, be sure to get online. Everyone turns to the Internet when researching businesses, so it’s absolutely essential to make sure yours gets properly indexed by search engines. By building a website and stocking it full of information about your company, you’ll reach out to more people than just those in your immediate area. If you’re searching for a wholesale print company to cater to your clients’ printing needs, look no further than Color FX. We provide quality printing services at competitive prices, so that your print business can thrive. Some print companies make the mistake of talking to their prospects about presses and processes, rather than focusing on what the customer is trying to achieve. Print companies that talk to their potential clients about their end goals are much more likely to make the sale and build a strong relationship with the customer. Their prospects will see these printers as partners who can help them achieve their business goals. Instead of pitching a generic “one size fits all” sales approach to potential customers, tailor your sales pitch to your prospect and their business needs. Focus on what motivates your prospect to buy print in the first print. There has to be a drive to place a print order, typically according to a business plan. Printers who talk to their prospects about business plans and growing pains are likely to get the order. Be sure to differentiate your company from other print companies so that the prospect isn’t tempted to choose solely on price. If you’re looking for a wholesale print company to keep your potential clients and current customers satisfied, look no further than Color FX. With competitive pricing, fast turnaround times, and excellent customer service, Color FX has everything your company needs to stay ahead in the print industry!